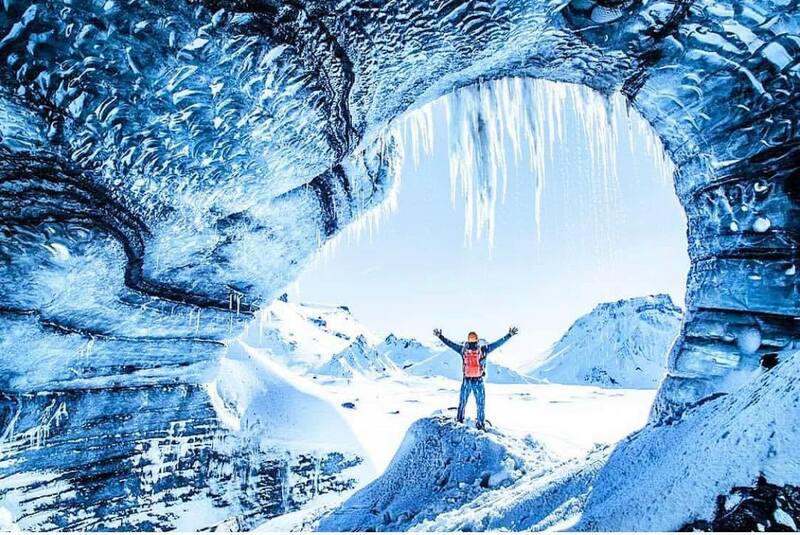 Come along to experience the extraordinary beauty of an authentic Ice Cave with this super jeep tour to the 'Secret Ice Cave' in Mýrdalsjökull glacier. Those travelling the South Coast and want to add a once-in-a-lifetime trip to their winter holiday should not let this opportunity pass them by. You'll meet your guide in the picturesque village of Vík, where you'll step inside a large vehicle known as a super jeep and begin your tour with a 30-minute drive through the barren wasteland of Mýrdalssandur desert. You'll travel along an old dirt track only accessible with the heavily modified super jeep which is specially built to handle the rough Icelandic terrain. Your local guide has years of experience in the Icelandic nature and can tell you everything you need to know about the Mýrdalsjökull glacier, the volcano Katla, and their surroundings, as well as fascinating stories from the nearby area while you enjoy the impressive views out the car's window. Journeying inside the cave, known locally as 'The Secret Ice Cave', you will have the chance to see the beautifully coloured layers of the high ice walls that make up the cave, and see first hand how centuries of glacial water trickling through the 800-year-old ice can carve such a spectacular cavern. The scene is spectacular. You will see the fresh water dripping all around, and feel the cold and crisp mountain air in your lungs. Surrounding you is nothing but the white, untouched glacier, blackened at places from past volcanic eruptions. Don't miss out on witnessing the magical world inside an ice cave. Book now to experience this one of a kind tour accompanied by a local guide! Check availability by choosing a date. Departure time : 10:00, 13:45. Please note that the conditions in the ice cave change depending on the weather. Your safety is our priority so we might need to cancel the tour with short notice. Really fun and nice. The crue were professional and aiding whenever we needed. The ice cave is a must do thing.